Ooops. I meant to say " This review is impartial ". This review isn't impartial because other review's picture don't show anything except a photo of the phone. THIS review's photo also shows icons for the phones capabilities. This just isn't fair, since anything this Nocrapia 700 has , like the icons show, nfc, email, app market and gps...Android and iOS have them both, and then some. It just isn't fairplay when other review dont have explicit front page photos that give hints about the specs and hardware. It's like subliminal advertising. This is good for wiewing pictures on your TV! Anonymous, 02 Nov 2011Oh, and I've forget to ask: who many people do care for HDMI output (probably only you)?i have hdmi on n8, but dont use it often. not even tv out... at home, my tv is connected to my pc, so i used it only to show pictures and few times i played hd movies at my friends house. so, yeah hdmi is useful, but depends if you know how to use it. a LOT of people dont know squat about what their expensive mobile can do, so they dont use it. Fic, 01 Nov 2011Great phone for me. One of my favorite Nokia latest phones although it doesn't have front came... moreYes it does have a front camera! You just can't see it under the gorilla glass and the clear black screen. someone showed it to me. He had me call his number and when I dialed, the pop up window offered to connect by video-call or regular call. It was really cool. I selected video-call, and viola, video-call! I just had to make sure I was in 3G coverage as well as the person I was calling. OptimusNext, 01 Nov 2011Good to see Nokia has finally gone Android. I thought they didn't like Android because they ca... moreActually.. I like this version of Symbian better than Android. I do have an Android phone, but I find this "Belle" much easier to use. Plus I don't have to worry about running out of memory like in my Android. I constantly have to kill apps using Advanced Task Killer. The 700 is so nice to hold in your hands. It feels really solid and expensive feeling. Plus the screen's just gorgeous. macchia nera, 02 Nov 2011again, how about important stuff, such as battery life instead of this useless bashing?I have this phone and what I've noticed is that it lasts about 2-3 days of moderate use, just GSM, texting and 5-10mins of calls a day. Hope this helps you. again, how about important stuff, such as battery life instead of this useless bashing? AnonD-3575, 02 Nov 2011how many smartphones that are middle class have hdmi out? probably none. why is it important? ... moreOh, and I've forget to ask: who many people do care for HDMI output (probably only you)? Back to the darkages, 01 Nov 2011Oh really ? So Nokia flashes a flagship, turns out to be crapzilla AND noone is justified to c... moreYou got to be kidding. Who said that this phone is a FLAGSHIP? How many high-end phones have HDMI and how many MIDRANGE phones (which is the case) have HDMI (none)? You are probably doing that only for fun because I don't know how can someone even think of this phone as a flagship, this is a CHEAP, MIDRANGE phone, get it? It's the same price as midrange droids like Samsung Ace or HTC Wildfire (althrough much better in almost every aspect :) ). Back to the darkages, 01 Nov 2011Oh really ? So Nokia flashes a flagship, turns out to be crapzilla AND noone is justified to c... moreAre you freaking kidding me. A fail like the N9? Are you nuts? Every expert review here has lauded that device, and by proxy Nokia, for bringing something new, UI wise, design wise, concept wise, that all these generic Asia me too plastic slabs copying iPhone never did. 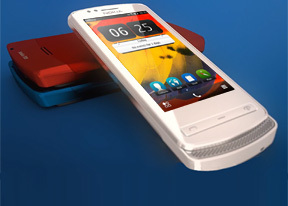 Nokia is the only company from the traditional group of manufacturers, who actually innovates. All LG Samsung et al do is push in a bigger processor and use suboptimal software that is soon to be no more available anyway. [deleted post]how many smartphones that are middle class have hdmi out? probably none. why is it important? what about mhl which only works on supported TVs? the future are smartTVs, in which you can plugin a usb stick, mobile, digital camera,... and use them as on a pc. so no need for hdmi or tv out, just micro-usb. also, theres dlna which is now reserved for expensive TVs, but hey, how many mobiles had gps in 2007? even the first iphone didnt have gps and now the cheapest android has one. this phone has only one flaw, narrow screen. lack of apps is subjective. there are symbian apps not available on android that are, imho, very useful. also, sound quality should have been better, but 90% of people wont see a difference. same with camera, fixed focus is better for people who dont know much about photography. Anonymous, 01 Nov 2011Also, HDMI is a thing of the past, the future is NFC and DLNA which this cheap mid-range phone... moredlna is a certified fail. just like upnp.